Wilson claims that he created a software that can trade financial markets with a 98% win ratio. This allows it to generate average daily profits of $1000 with just $300 as starting capital. And wait, miracles are not over, because Wilson is giving his Aussie Formula away for free. Strange, isn’t it? The truth is that Aussie Formula is just a cloned scam, we have already exposed it when it was called the Brit Formula, see our picture for a comparison. The roots of this scam are several years old, it has countless clones, like the Brit Method or the Saffa Method. It was translated in every major language. It always uses the same video and the same bogus story. Jake Wilson is not the creator of the Aussie Formula, this guy does not exist. It is a fictitious character made up by scammers. Check our picture and you will see that his alleged picture is in fact a stock photo. The same trick has been used with all the other versions of this scam. In the Aussie Formula video you will see people endorsing the program, but they are paid actors, and as we already mentioned, the same video has been used by all the different versions of this scam for years. 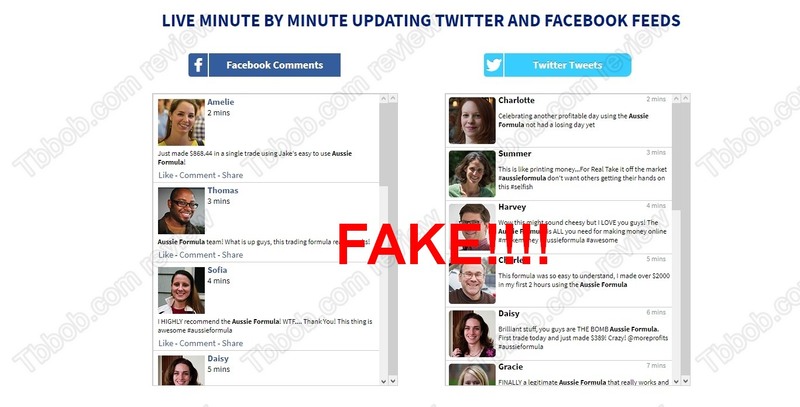 The static testimonials on the website are fake too, stolen photos were used, these people are not real users of the system. In reality Aussie Formula is not free. Right after signing up they will tell you that you have to deposit money with a selected broker, you will have no choice. This broker will be unregulated. People who run this scam get paid by this broker for sending him new victims who will deposit and lose money, that’s how it works. The Aussie Formula is a well-known old scam with a new name, stay away from it! If you are really interested in making money in trading, start risk free on a demo account with a regulated broker. There are things you must understand and learn to become profitable. Only if you manage to do that in testing, you can then switch to real money trading.